As a child in school, I was taught that Christopher Columbus discovered America. As a Tlingit who was raised to know Native people have been here since time immemorial, the curriculum was baffling to say the least. The celebration of Columbus Day is a black mark against Native people who called this land home thousands of years before Columbus’s “discovery.” While we recognize that Christopher Columbus was among the first Europeans to land on the shores of the North American continent, it is time for Alaska to eliminate Columbus Day and recognize the Indigenous Peoples of Alaska. It is in that spirit that I submitted testimony today urging the Alaska Legislature to pass HB 78, which would officially establish the second Monday of October of each year as Indigenous Peoples Day. Public policy advocacy is a task we do frequently, and I offer my testimony below to give people a peek into our efforts at the state level and to encourage people to speak out on this proposal. While we recognize that Christopher Columbus was among the first Europeans to land on the shores of the North American Continent, it is time for Alaska to eliminate Columbus Day and recognize the Indigenous Peoples of Alaska. The rich culture and Indigenous knowledge of Alaska Natives have been of great influence in Alaska and it is time to celebrate and recognize those cultures by establishing the second Monday in October as Indigenous Peoples Day. Sealaska Heritage Institute (SHI) is a regional Native nonprofit founded in 1980. The institute’s mission is to perpetuate and enhance the Tlingit, Haida, and Tsimshian cultures of Southeast Alaska. Its goal is to promote cultural diversity and cross-cultural understanding. 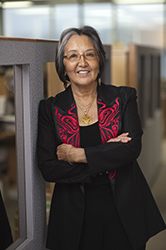 SHI has worked for over three decades to preserve and enhance the culture and language of Native Peoples. We have promoted the integration of culture and language into schools because of the benefits it provides to Native Students. We also believe that these efforts support cultural diversity that make Alaska a richer state. Governor Walker started the movement toward establishing Indigenous Peoples Day in 2015, and I believe that we should make this change permanent. The past few years we have seen continued support of Alaska Native Heritage with the signing of HB 216 changing the State Language from English to include 20 Alaska Native Languages as official state languages and more initiatives to support Alaska Native education, language and culture. The contributions by Alaska Natives to the State of Alaska have been significant and it is time we acknowledge and celebrate those contributions. We respectfully urge you to adopt HB 78 establishing the second Monday in October as Indigenous Peoples Day.